If you want a minivan the 2007+ Toyota Sienna is the most reliable. The 2008+ Honda Odyssey is a little less reliable, but still pretty good. Minivans are much more practical thatn SUVs because they use their space efficiently. SUVs are smaller on the inside and larger on the outside (at least, they feel larger to drive). I'm assuming you want an SUV because no one wants a minivan anymore. 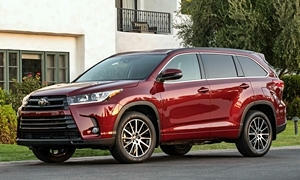 The 2008+ Toyota Highlander is the most reliable midsized SUV. 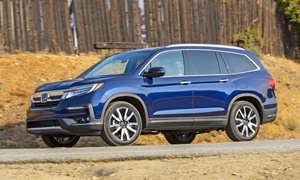 After that you should look at the 2009+ Honda Pilot. 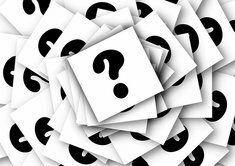 For your price range, any vehicle that you select is likely to have north of 100,000 miles, so be on the look out for deferred maintenance and make sure the timing belt (if applicable) has been changed, spark plugs aren't too old, etc.... I agree that an Odyssey or Sienna are your best bet. Some Odysseys had transmission problems, but most were fine. Make sure you test drive it and make sure it shifts smoothly. Minivans are more efficient and easier to access due to the sliding doors than SUV's. As far as SUV's go, the Pilot, Mazda CX9 and Highlander are good choices. Less roomy than the Minivans though, and the third rows don't leave much space. If fuel mileage is not a concern, consider a used Suburban. They are huge, body on frame vehicles, but they are comfortable and the V8's are fairly bulletproof. 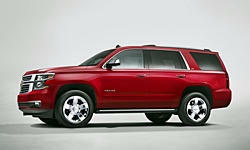 I would recommend a Chevy Suburban or Yukon XL. These are extremely reliable vehicles that will last forever if well maintained. There is way more space in these than any minivan can offer. 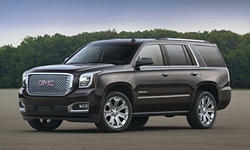 Just an FYI, the Chevy Tahoe and GMC Yukon have extremely small third row seats due to the use of a solid rear axle. If you are planning on carrying adults in the third row seat, definitely spend the extra money for the long wheelbase Suburban or Yukon XL. While a Suburban is a solid option, it does not offer more space than a minivan. A Suburban has 95 cubic ft of space behind the front seats while an Odyssey has 148. Dnslater is right. Even a gigantic Suburban is not as practical as a minivan. The Subarban has less interior space, has a larger exterior, is much less efficient, and has a rougher ride than ANY minivan. All these negative points about the Suburban and Tahoe actually cost you money. A Suburban starts at $21k MORE than a Sienna. 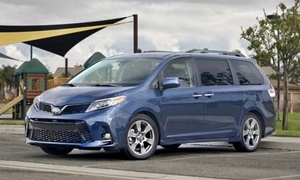 The Sienna and Odyssey are both more reliable than the GM body on frame SUVs and have power sliding doors, which means you won't have to worry about your kids opening and hitting their door on another car.